Biodegrabable products are friendly to us and the world we share. These products breakdown quickly through natural processes that yield harmless by products such as water and carbon dioxide. Unlike petroleum oil, styrofoam and aluminum cans, biodegradable products are made of natural resources such as plants, animal byproducts and minerals that breakdown quickly to enrich the environment. Biorenewable products can be replenished with the passage of time, unlike oil, natural gas and diesel, which may run out one day. Biorenewable products are a part of our earth’s natural environment. They reduce air pollution, soil contamination, land degradation and animal habitat destruction. Biosustainable products can be replenished because they use natural substances that are plentiful and cost effective for the efficiency of our economy on a long term basis. Examples of common biosustanable products is the use of more organic fertilizer to sustain and perpetuate the biosphere which is our planet. In business since 1951, Metalloid manufactures trouble-free technology to the metalworking industry with a focus on providing quality products and service that will increase productivity and profitability. We do this by performing a thorough survey of your operation to match the right product to your application. We compliment our products with services such as training seminars, in-plant surveys, and the resources of our state of the art metalworking laboratory. 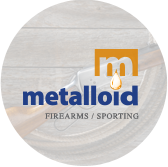 In addition to traditional metalworking fluids, Metalloid offers a complete range of “green” metalworking fluids that are friendly to us and the world we share. The proper selection and application of metalworking fluids can result in increased productivity, reduced waste and down time, and lower cost in your manufacturing operation. 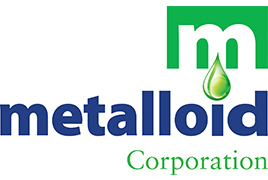 Metalloid offers superior products formulated with consideration for the environment, health and safety. 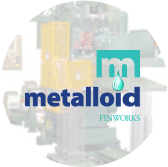 Metalloid’s Metalworking Fluids (MWF) are used to cut, form, clean, protect and condition metal surfaces and the products manufactured from them. 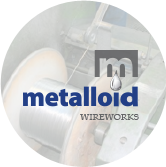 Metalloid applied their expertise in botanical technologies to manufacture “green” wiredrawing lubricants and products that are safe for us and the world we share. 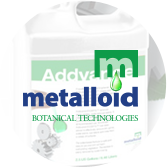 Metalloid’s goal is to be recognized as the leader in “green” lubricant technology through the utilization of botanical technologies. 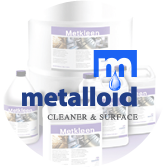 Metalloid’s METKLEEN cleaner line is designed to remove soils in any application and on any metal. We manufacture alkaline cleaners, acid cleaners, emulsion cleaners, and “green” cleaners. Metalloid’s FinWorks business has grown continually over the last 15 years and today Metalloid is a global leader in HVAC & R manufacturing lubricant technology. 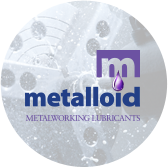 Metalloid manufactures an extensive line of MicroLubricants used in the process known as Minimum Quantity Lubrication(MQL) or Near Dry Machining (NDM). 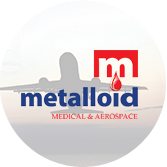 Metalloid has the specialized lubricant technology you need for medical and aerospace applications. How are Metalloid's businesses going green? Metalloid believes that through the use of Green Technology, industry, people, and the environment can co-exist and prosper. We made a commitment to do our part through research and development to develop a complete product line that will contribute to a safe environment for us and the world we share. To accomplish this our product development efforts are focused on utilizing raw materials and services that address our commitment to the environment. We believe in ONE SOURCE … ONE SOLUTION…ONE WORLD. Our goal is to provide trouble-free products that will contribute to the efficiency, effectiveness and profitability of your company. The proper selection and application of metalworking fluids can result in increased productivity, reduced waste and down time, and lower cost in your manufacturing operation. 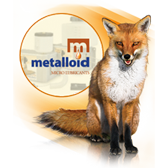 Metalloid offers superior products formulated with consideration for the environment, health and safety. Our commitment is to provide the highest quality products backed by experienced technical support personnel who ensure that our customers’ needs are met. The quality of every product and shipment is controlled to assure uniformity and consistency. Our quality control staff works closely with production personnel to ensure quality products and on-time delivery for customers.